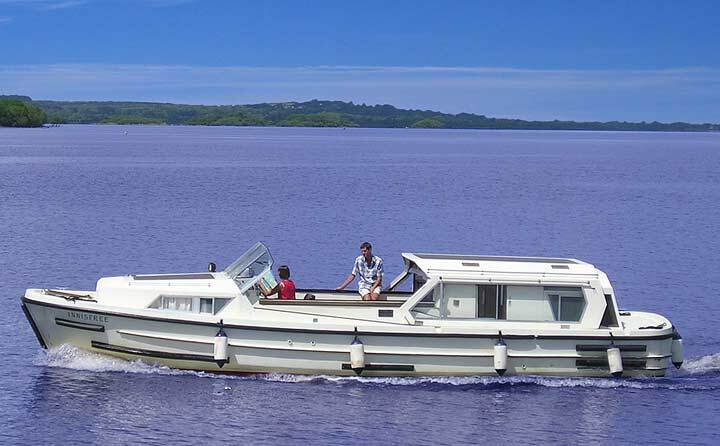 A Cruise South takes you through the leisurely River Shannon to the wider expanses of Lough Derg which is wonderfully scenic, or a Cruise North takes you to the newly restored Shannon Erne Waterway through old world canals and the gently winding Woodford River to Lough Erne. On arrival, our staff will show you aboard and take you through all aspects of handling the cruiser including a full test drive. For beginners or people with limited cruising experience, we provide additional tuition on the navigation and cruiser handling, and if necessary, our instructor will accompany you on the initial hour or so of your cruise. We provide a quality efficient service to cope with any problem or emergency and the provision of a mobile telephone on the cruiser gives you immediate access to us for help or advice. The local village of Glasson has attractive pubs, award-winning restaurants, craft shop and modern supermarket open daily until 9 p.m. For golfers, there are two golf clubs on Lough Ree with access for cruisers. NB. For people with "no cruising experience", special instruction can be arranged in advance of their holiday.